Trametes versicolor, more commonly known as the turkey tail mushroom (named for the concentric bands of brown, beige, gray, green and rusty hues which resemble the tail plumage of a turkey) is a very common mushroom in temperate woodlands, but can be found all around the world where suitable habitat exists. 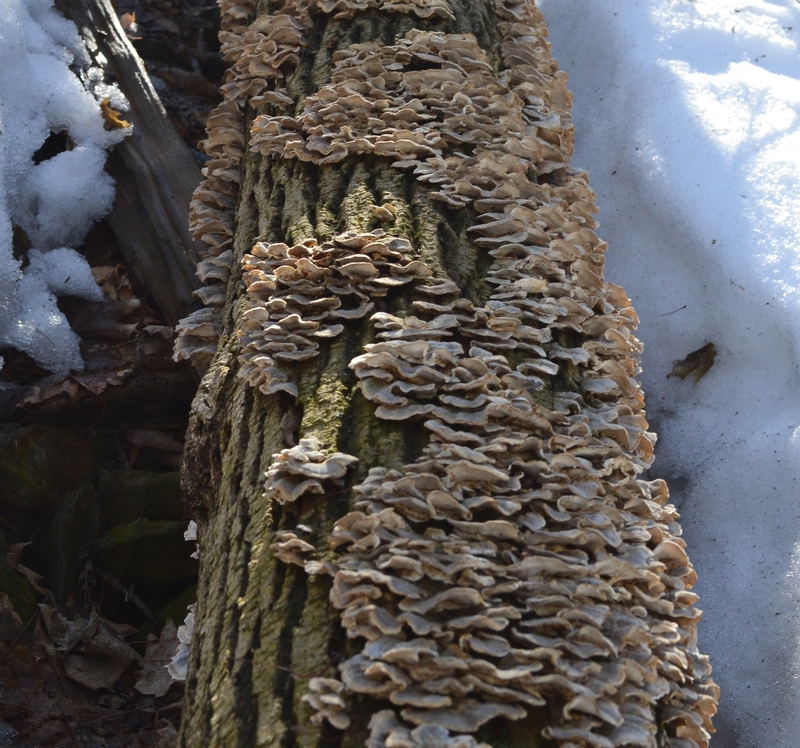 It is encountered regularly here in southern Ontario, growing out of a variety of downed hardwood trees, stumps and branches. The fungi fruit in mid to late summer with slightly tilted, congested waves of 1-3mm thick stemless caps with a velvety, leathery texture. The mushrooms are very durable and survive in good condition straight through the winter and into the following spring. Dry, crispy looking turkey tail mushrooms in autumn miraculously revive themselves by absorbing moisture after a rainfall and usually remain plump and pliable during the winter months. The photo below was taken on Tuesday, March 11th along the Bruce Trail, which follows the bottom talus of the Niagara Escarpment in Stoney Creek where I currently live. That day was a particularly balmy 11°C, resulting in the previously frozen and snow covered trails to become either slick with mud, covered in a wet sheet of ice or an unimaginably sloppy combination of the two. It was a good thing that I decided to take advantage of that warm spell to investigate what the temporarily melting snow would reveal because not only only would I not be writing about this encounter, but the next day saw an afternoon high of well below freezing, viciously bitter winds and 10cm of snow accumulation. A meander through the woods and wild places is never a waste of time, as I was lucky enough to strike a medicinal mushroom gold mine. For a wealth of information on the medicinal properties of turkey tail mushrooms, check out this and this. I was going to write my own interpretation of their findings but figured that I might as well not reinvent the wheel as these writers and researchers communicate their results more effectively then I would be able to anyways. So now that you are well versed in why you ought to get your hands on some Trametes versicolor, how might one go about doing that? Well like a lot of resources, nature provides quite a bountiful and long-lasting crop of turkey tail mushrooms every single year, and if you are reading this from somewhere in Ontario, they are likely quite close to you somewhere right now. However, given the fact that there are an awful lot of people on Earth the last time I checked, the natural production of these mushrooms is most certainly less than the demand would be if everyone was as open minded as you or I, especially if more people become acquainted with the benefits that these fungi can provide us with considering the growing instances of diet and stress related diseases. Luckily, these mushrooms can be grown quite easily using kits that can be purchased from mushroom growing companies such as Fungi Perfecti (based on the American west coast) or The Mushroom Patch, based out of Chatham/Kent county in Ontario, for you locavores. It’s also important to note that obtaining your turkey tail mushrooms, whether by ordering them from a retailer or whether wild crafted are a) identified properly by an expert and b) do not contain any contaminates, unwanted byproducts, fillers or other such disappointing and unnecessary inclusions. Sometimes retail outlets / companies which do whole sale of medicinal plants and mushrooms are not always certain as to the origin of their product, as they may frequently change sources based on product availability, ‘perceived’ quality and -wait for it- price, all of which may influence the quality of what you are getting. Even though I already mentioned that in many places collecting the mushrooms for yourself is not an option, use your noodle. If nobody knows what these mushrooms are, where they can be found, or how to identify them with enough certainty as to go through all the trouble of brewing them and actually drinking the delicious, mossy-flavored beverage, then you are probably going to have them all to yourself or whoever you choose to share them with. As always, don’t be a jerk and harvest sustainably, if that is the direction that you choose to take. In my humble opinion, turkey tails are best harvested by hand. Although they often appear in dense colonies. those groups are often composed of clusters of caps attached by small nubs directly to the bark which can be ripped off without too much effort. When there are this many mushrooms in one spot, it does not take long to accumulate more than you are going to need. Once returning the mushrooms home, I broke them into small ‘corn flake’ sized pieces and spread them out evenly on a plate to allow them to dry. Once they become brittle, they can be broken into smaller chips or even powdered in a coffee or spice grinder to expose even more surface area which extracts a greater concentration of the beneficial proteins, micro nutrients and other medicinal compounds. I have searched through a number of different online sources and am continuously coming out empty handed when it comes to solidifying a dose and serving of the active medicinal components of these mushrooms. One source suggested 10 grams of dried mushroom boiled for an hour and a half to two hours in 16 liquid ounces of water to make tea, but I couldn’t find this claim backed up or duplicated by another source or recipe. So I decided to try it out and when I measured out the mushrooms and water it looked to me like the tea would be too strong and so I doubled the amount of water to 32 liquid ounces (4 cups or 1 litre). After it was brewed, the flavor was quite nice, although you shouldn’t really listen to me because I can drink and eat some pretty weird stuff. If you find the taste too strong and mushroom-y, either add more water or less dried mushrooms next time, or add a sweetener such as unpasteurized honey to balance the weirdness and also to add more health promoting enzymes and micro nutrients. You could also add this mushroom tea to soups, stews, chili or anything else like that so that you can disguise the flavor but still get the benefits that you want. I find the tea very contemplative and interesting, so I’m probably just going to keep it simple and stick to that. Before I bring us in for a soft landing, I also want to introduce you to another method of processing medicinal mushrooms, which is also applicable for some other plant based medicines as well, and this is known as a double extraction. In order to achieve this, you create a concentrated tea like I discussed above, but you also steep the dried mushrooms in alcohol to form a tincture. There are different chemical compounds in the mushrooms that are responsible for their therapeutic properties, some of which are soluble in water but others that require prolonged steeping in alcohol to extract. In order to do this, fill a container halfway up with loosely packed dried turkey tail mushrooms and then pour in enough grain alcohol/ethanol or high quality vodka to fill the container. Put in a cool, dark place and shake every day or so to keep the mushrooms suspended. After 3-4 weeks, the tincture of done and can be mixed with a tea that you make fresh that day. This is your double extraction, and can be consumed in a variety of ways to make the best possible use of ingesting both the alcohol and water soluble compounds from the mushrooms. As the strength of the sun continues to strengthen and the bitter nights lose their grip on the land, nature is preparing for her greatest unveiling. During this time, the ‘natural produce market’ (i.e. fields, fence rows, forests, backyards etc.) is slowly opening it’s doors with a flush of much anticipated greenery and life. As the seasons transition from one of stillness and quiet to one of vibrancy and growth, expect quite a bit from me as my regular skirmishes and explorations in nature reveal more hidden gems in the form of roots, leaves, fruits, medicine and mushrooms. The best season, the growing season, is just around the proverbial corner and I’m as excited as ever.